I was really looking forward to the Malvern Hills Ultra again this year. Not just the race itself and the opportunity to run a fantastic course but also see how I have improved against last years’ time. Unfortunately the weather wasn’t in our favour yet again. Last year we had rain on the day. This time the rain had been coming down hard for two weeks beforehand and meant the course had to be rerouted. 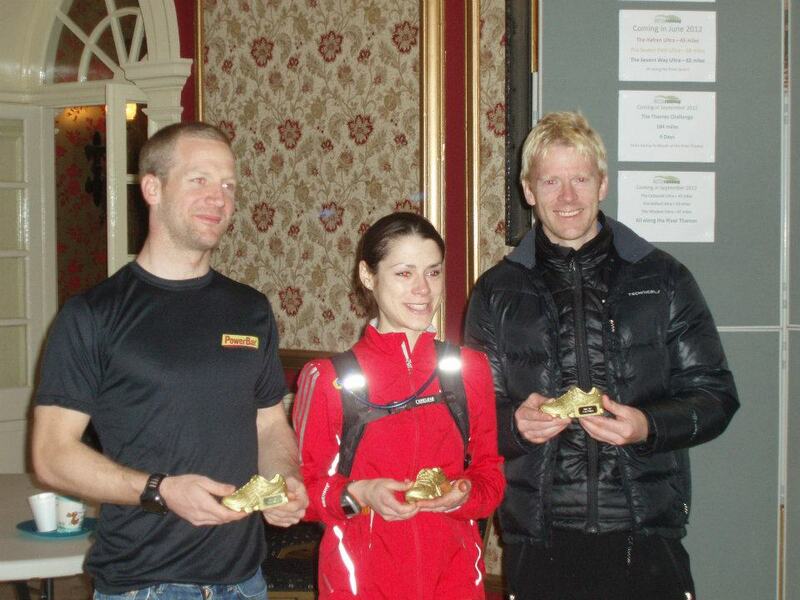 Despite the last minute changes UltraRunning once again organised a great event. The new course was shorter, simpler, but yet a lot more demanding (most people had a few navigational slips on the day). Rather than a 55mile looped race starting along the river Severn, we now had to run 52miles as an out and back along the final 26miles of the loop. This meant crossing the Malvern Hills range twice! Although the course was now 3miles shorter it was almost 100% hillier with 8000ft ascent. Despite not being able to compare myself wholly against last year’s splits I relished the challenge of the more demanding course. I seem to race quite well over more technical courses, and I could still compare myself against the final 3 legs coming back from the Malvern Hills Hotel (Checkpoint 3). If I was quicker over these final three legs compared to last year having traversed more hills, then it was an improvement. The race is quite close to the town I was brought up in, so I headed down to Holt Castle with my parents and Yve, and then met up with friends James Ogilvie and Gemma Carter. We were also racing as Team-Powerbar (James had arranged some sponsorship with them before the event). I was also lucky enough to get sponsorship from OMM a few weeks previous, so was looking forward to racing with the OMM sonic smock amongst other things. A great piece of kit. My training over the previous two months since the Green Man Ultra had been hit and miss. I’d managed a couple of ~100mile running weeks but still struggled to find the time to fit in the training I’d planned. But apart from a tight hamstring I was injury free and rested. I was keen to try and increase my pacing this time, but didn’t want to blow on the hills so decided to keep it steady on the out section and then use up whatever I had left on the return. The race itself started at quite a pace and I had to get some speed up to latch on to what became a lead group of five that including myself, James, Kevin McMillan (2nd last year), Bruce Moore and James Dowdall. I didn’t know at the time that Bruce and James were in the 83mile event that was starting at the same time. The race once again included punch-points. We were given a punch-card that had to be marked at the various punch-points around the course. There were six going out (twelve in total) – two in Ockeridge woods a few miles from the start, and four along the peaks of the Malvern Hills. We were running at such a pace that we almost missed the first punch-point. But despite this and losing my shoe in the mud of Ockeridge woods I managed to claw my way back up with James at the front and we reached Checkpoint1 (CP1) at Martley in 55mins, an average of just over 7:00/M for 7.7miles which was quite fast considering some muddy off-road sections. All of the checkpoints were manned by friendly staff with a good selection of snacks and liquid. 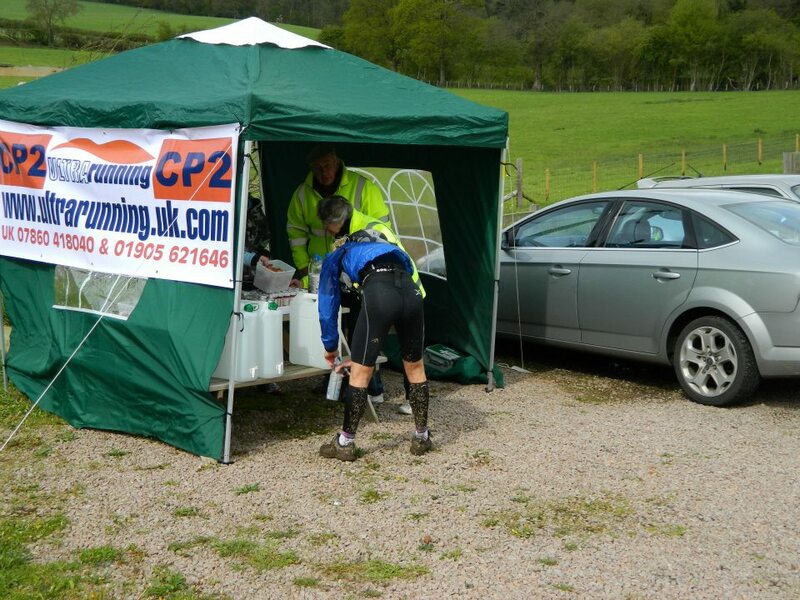 CP1 to CP2 (New Inn) was the longest section of the race at 11miles and followed the Worcestershire Way along hilly fields and woods through Berrow Green, Knightwick and on to the Malvern Hills range. James and I were keeping a decent pace up to Knightwick but then he had to stop briefly, and I didn’t see him again until the turnaround. I really enjoyed the wooded section along the spine of Ravenhill and the Suckly Hills. They were a bit slippery underfoot on but generally easier on the legs. I reached the New Inn after 2hr44 race time. My pace over the last section was just 8:40/M thanks to the hills and a few small navigation errors. CP2 to CP3 (Malvern Hills Hotel/turnaround) was just 7miles long but had the majority of climbing with peaks of around 400m each. There were some steep sections to start with through the outskirts of the town that were unrunable so it was important to keep my efforts contained. I’d occasionally glance over my shoulder at this point to see if anyone was behind me and I think I spotted the white top of James at the bottom of the hill about 5-10mins away. I then kept an eye on my Garmin’s grid ref as I ran to make sure I didn’t miss the punch-points. The first one around Lady Howard DV Drive on North Hill was simple as it was literally on the path. But I just couldn’t find the punch-point on the Worcestershire Beacon. I spent about 3mins hunting for it around the trig points and benches but had no luck and eventually gave up. To make matters worse I also couldn’t find the next (penultimate) punch-point despite once again checking map and grid ref. We’d been told at the pre-race brief that there was a 10min penalty for each missed punch-point, with a bonus 10mins for a total of more than three. I was quite cross at this point. I’d made every effort but just couldn’t find them. At the Hotel (CP3) I took a few minutes to confirm with the organisers. Unfortunately I was the first person to arrive so I didn’t know (until later) that one punch-point had been removed by the public and the other one at the Worcestershire Beacon was actually 30 metres down the side of the hill and out of sight if you run straight over the summits, which is what I and a number of others had done. 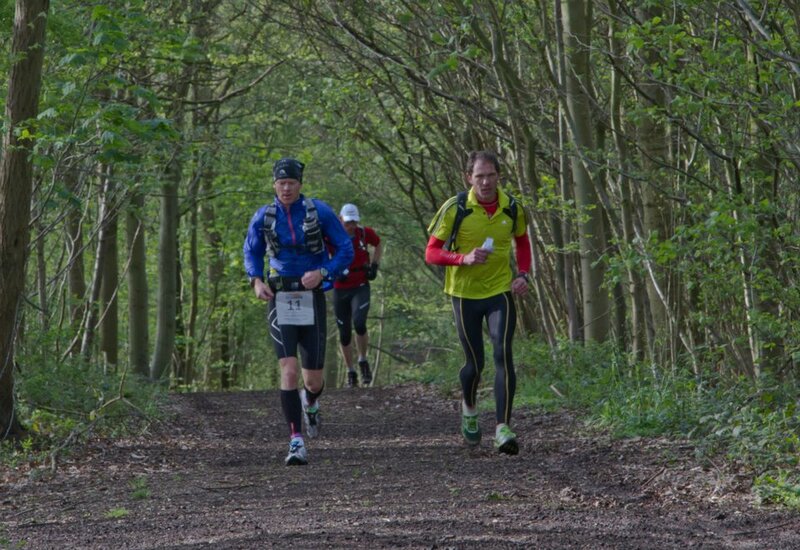 After a long break at CP3 I set off and soon passed James and Kevin locked in battle and about 10-15mins behind. I’d managed to get confirmation from James and the following runners concerning the punch-point problem. I could now concentrate on my race again. I did spend a minute or two back on the Beacon to find the elusive punch-point (more out of intrigue) and then relayed what I knew to the remaining runners I passed as I came back down the hill. The run back off the hill was fun and I’d got my racing head back on. The two Malvern sections took me 1hr10 (out) and 1hr15 (back). This was a few minutes quicker than last year. From CP4 back to CP5 at Martley I managed to keep up a steady pace. I’d give myself the excuse to walk the muddier and steeper sections through the woods but generally I felt quite solid. I completed the 11mile section in 1hr42 which was also about 5mins quicker than last year despite a few small navigational errors. I didn’t hang around at Martley as I knew there were only 8miles to go, most of which would be on path and road. I don’t know what happened but my final split time came out at 1hr12, 17mins slower than going out. I made a small navigational error, but apart from that I thought I’d kept the pace up. I may have taken some walking breaks without thinking about it. It’s around this time I always start to think about the possibility of someone catching me, so I would occasionally glance over the shoulder down a clear road, calculate the minimum time to run it and divide by the number of miles remaining. This tells me how fast (secs/mile) someone would have to run to catch me. Sad, but keeps me amused. Yve and my parents at Martley. 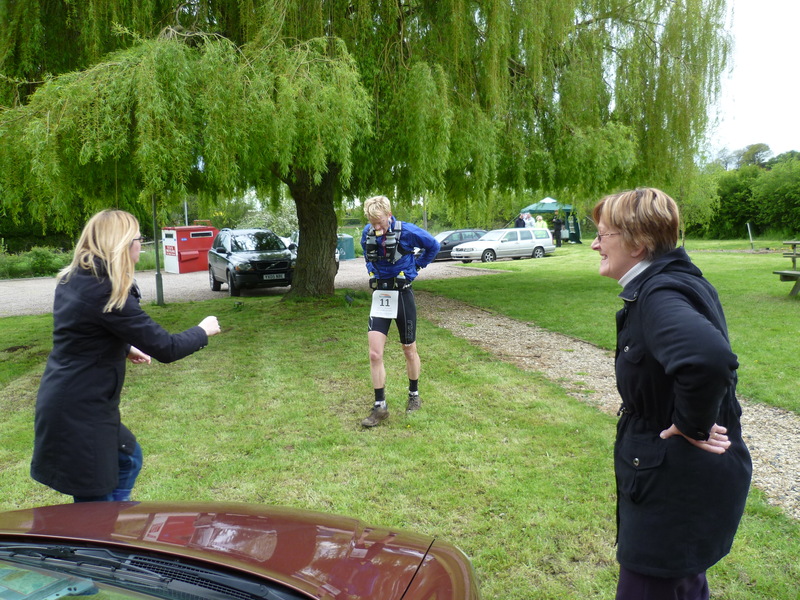 The toughest part of the day was having to force myself away from the free food at the aid stations! I crossed the line in 7hr49min which I’m pleased with considering a few minor issues. Kevin finished second in 8hr21 with James a few minutes later. Gemma also just missed out on first female by a couple of minutes. But overall we won the team prize, and a golden boot each! The organisation of the event and hospitality at the castle was awesome once again. 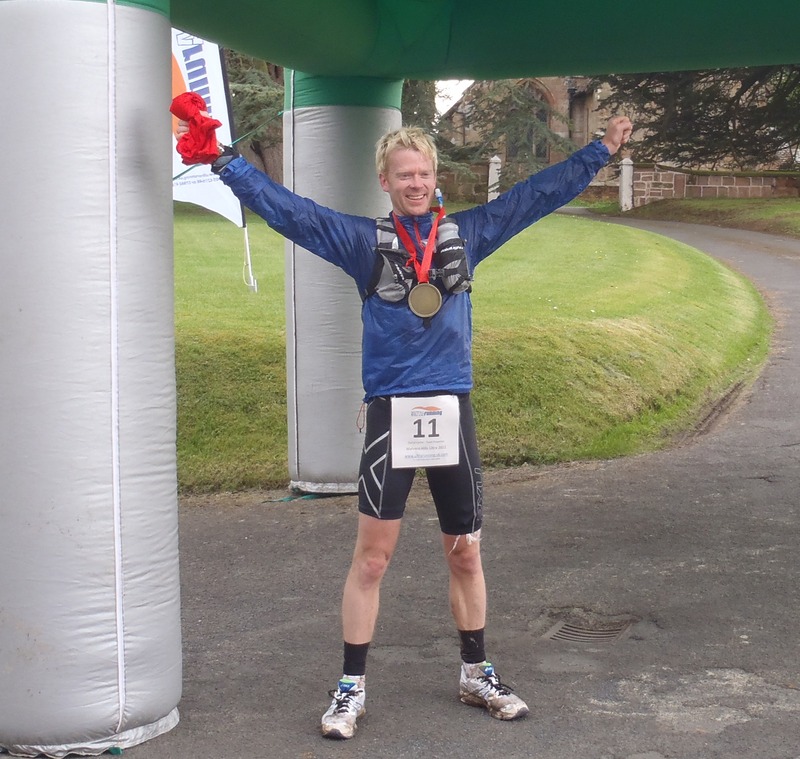 I’ll certainly be back in 2013 to tackle one of the two courses again (the organisers are keeping both routes and having two separate races). I do enjoy these challenges. My next race is the Grand Union Canal on 2nd June which runs 145miles from Birmingham to Little Venice in London. That will be an experience, and I’m intrigued to see how far I can go! But, I need to clear up this hamstring first. My physio has told me I have old scar tissue, which was probably aggravated on the Malvern Hills. At least I have two good weeks to let it settle. I’ll have a great crew behind me once again, they’re bringing cattle prods! A few months after that I have the CC50 and NDW50. Based on this I’ll be aiming for <7hr30mins in both. 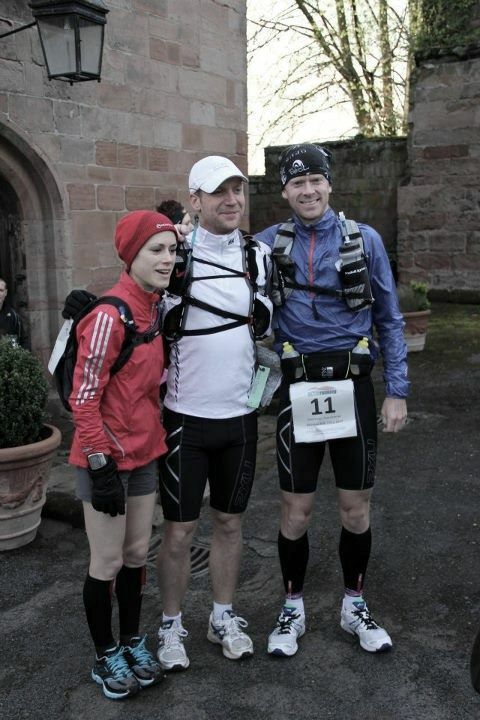 Congrats on winning the Malvern Ultra again – I was there running last year when you ran it for the first time. Back then I noticed that you were thinking of running the Cotswold Way and now noticed that it’s ‘in blue’ and you are confirmed to have a go this July. If you feel that you could do with a little help on the day/night then let me know, I may be able to come along for a while – I live in Gloucester and am up running over Painswick every week so I know the area quite well. I am still active on the Ultra front having gone on to complete the Longmynd Hike (October) and Thames Path 100 (March) and am currently due to do the Cheltenham Circular Challenge in a couple of weeks so covering a good distance over the hills is not a problem. If it’s just some hot drinks and not company on the day/night then I don’t mind just being at an agreed location to offer support. Anyway, have a think and email me back if you want to discuss further. All the best – Austin Blackburn. 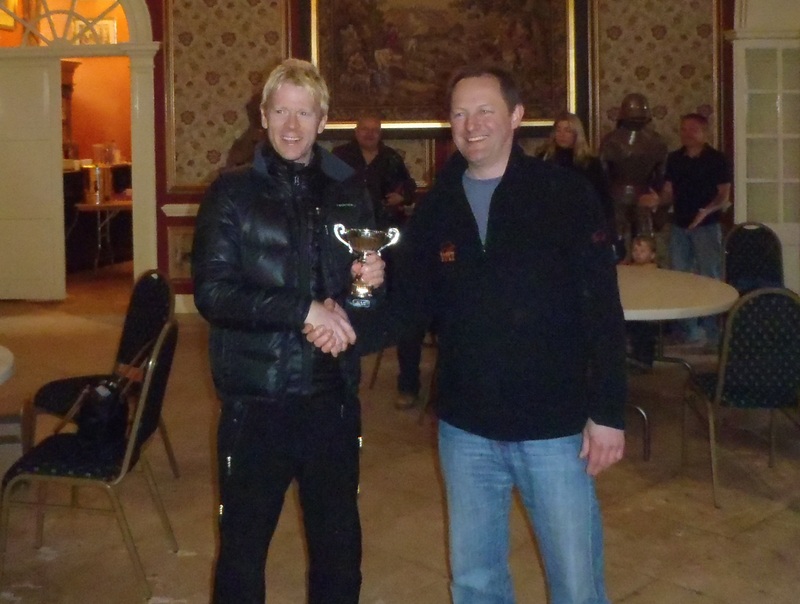 Nice result at the TP100! Yes would be great if you could join us – sent you and email. we’ve got a facebook page up on it. Just found your blog and I am really blown away by your races and results! I did find you because I am running the Malvern Hills 52 mile this year (2013) and wanted to ask someone who has ran it before some advice, if possible. It will be my first ultra (first marathon is in March) but I do lots of half marathons so not a complete beginner to running. I am following a plan which starts with around 40 mile per week to around 70mile closer to the race day (24 week plan). Also, is the navigating hard? I don’t have a tracker like you do..just a garmin for speed, which will run out after 6h I guess and the compass..
Do I need a team with me? Is the food in the CP enough plus the two bars of chocolate and 2L drink (camelbak) that they recommend? Many thanks and good luck with your ultras. It’s a great event, running along most of the Malvern range, before coming back on yourself. I love the course, it has everything with some great views. There should be a reasonable number of runners taking part so hopefully you’ll always have someone around you or within sight, at least for the out section. A 2ltr bladder/bottles is more than enough yes. In fact you could get away with 1.5ltr as you shouldn’t be more than 2hrs from the next checkpoint. Take a look at the splits from last year for an indication. Organisor provides a map, but worth marking out an OS map in advance and taking it with you. Compass will only be of use if you get lost of course, which hopefully won’t happen.